This is a premium grade Collagen Hydrolysate - Cold Water Soluble. It is unflavoured and has superior bioavailability and excellent solubility. Collagen is an important protein source for muscle and cell growth. Gelpro`s Peptipro Collagen Hydrolysate is rapidly absorbed, ensuring you get the necessary amino acids as and when your body needs them - before or after your workout. Peptipro is unflavoured and mixes so well unlike other protein powders, allowing you to mix with juice or any other beverage of your choice. No more gritty taste like other proteins and finally no more bloating from whey based proteins. We have selected a premium grade gelatin and utilised high quality German manufacturing processes where attention to quality is second to none. 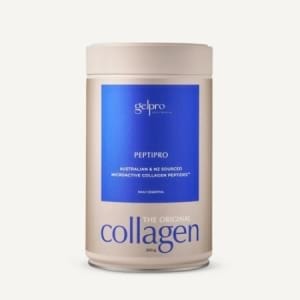 The product is packed in Australia which allows us to deliver a more premium product at a lower price compared to imported collagen hydrolysate.